As Chair of the Senate Finance Committee, Sen. Max Baucus is one of the most instrumental lawmakers in crafting the health care reform that President Barack Obama has promised. 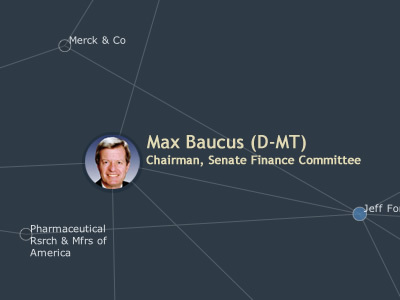 In his many years on the committee, Baucus has amassed a wealth of connections to the health care and insurance industries, often through his ties to former staffers turned lobbyists. The five former Baucus staffers who now lobby for the health care or insurance interests represent twenty-seven different companies or associations. In some cases these lobbyists have the same clients. 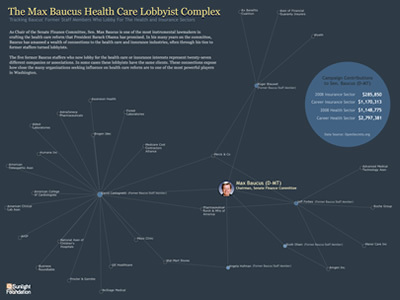 This map of connections expose how close the many organizations seeking influence on health care reform are to one of the most powerful players in Washington. All data was taken from OpenSecrets.org.